Autumn is a great time for nature walks. There’s so much to see, feel and hear – the crisp air, leaves changing colors, the earthy smells. It’s easy to get distracted and lost in your thoughts on a nature walk, so sometimes we need to bring intention to our walks. Intention to stay mindful and present in the moment. We can also find ways to connect nature to our mindfulness walks. 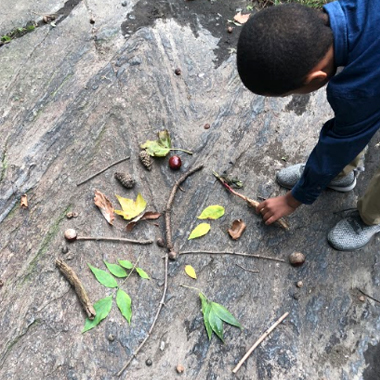 In our brand new Mindful Art Club at the Manhattan Country School, students explored nature and their senses in Central Park. The students main goal was to make process oriented nature mandalas using objects collected at the park such as pine cones and leaves. After making the geometric art, they later ceremoniously destroyed them. They were learning that we do not always need to hoard and keep everything we make and have, sometimes we can just enjoy the process and let it go back to earth. On the walk to and from from the school, students used their senses to notice the world around them. After gentle mediation, they drew what they saw on this free download, Autumn Mindfulness Hunt. We believe that students benefit from slowing down to engage the world through their senses. They increase their inner and outer awareness while developing more of a love for nature in their interaction with the natural world. Please get outside with your students. Enjoy our FREE Autumn Mindfulness Hunt with your students and let us know how it goes! We hope you enjoy our FREE Autumn Mindfulness Hunt. Get outside and connect with nature! Download our Autumn Mindfulness Hunt now. Give instructions for how to quietly be in the outside world, using keen observation and a relaxed mind to fill in this chart. Walk at a natural, slow pace. Take your time to take in the beauty of nature around you. Look around you. Notice the trees around you. Are they starting to change colors? Are they losing their leaves? Take in deep breaths through your nose. Shift your awareness to your smell. What do you smell? Does it smell earthy? Do you smell the leaves around you? Listen. What do you hear? Are there animals bustling around? Do you hear the leaves crunching underneath your feet? Pick up a few leaves. How do they feel? Are they starting to decompose? Are they crunchy? What color are they? Shift your attention back to walking. Feel the physical sensation of walking. One foot up, one foot down. Notice your feet touching the ground. How do you feel? At the end of your walk, pause and take a moment. Stand still and take in a deep breath. Take a look around and notice your feelings.